The National Library's purpose-built home opened in Wellington in August 1987. 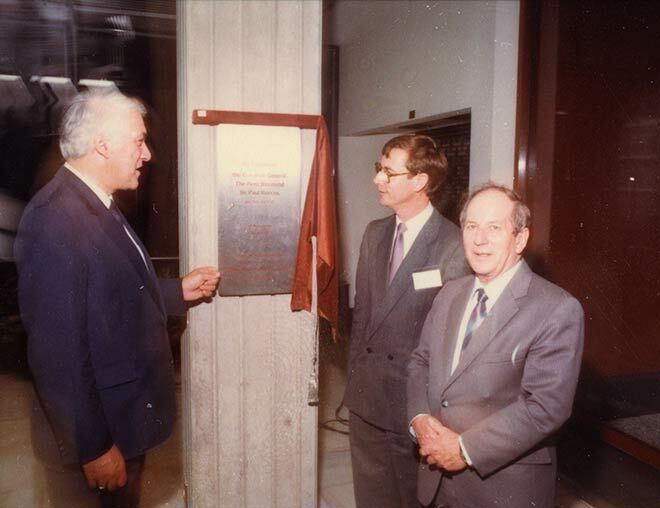 Here Governor-General Paul Reeves (left) unveils the foundation plaque. With him are National Librarian Peter Scott (centre) and Laurie Cameron (right), the chair of the National Library Trustees. Construction began in 1974 but stopped between 1976 and 1981 because of funding issues, design changes and industrial disputes. Before 1987 the National Library collection was housed in up to 16 different buildings throughout the city.